We urgently need your help to protect the world’s longest mule deer migration corridor, which is found right here in Wyoming. The U.S. Bureau of Land Management is set to auction several mineral lease parcels inside the corridor for oil and gas drilling, first in September and again in December. If these parcels are not deferred from leasing, they will be sold to the highest bidder, setting the stage for drilling inside this critical and sensitive corridor. The migration corridor is a lifeline for mule deer and provides important habitat for dozens of other iconic Wyoming species. The most powerful action you can take is to join us, first, to thank Gov. Matt Mead for his initial steps to protect the 150-mile Red Desert to Hoback migration route. Then you can ask him to stand strong by opposing the proposed sale of federal and state oil and gas lease parcels in this critical habitat. In addition to writing to Gov. Mead, you can also email the Wyoming Game and Fish Commissioners. Please encourage them to continue to defend this corridor — and all migration corridors in Wyoming — as vital habitat that warrants the highest levels of protection. Lisa McGee, our executive director, recently thanked the governor for his support of the corridor and asked him to take additional steps to protect it from oil and gas leasing. You can read her letter here. Ongoing research has revealed that mule deer traverse a particular route each year, moving north from low-lying wintering grounds in the Red Desert to the higher elevations of Hoback Basin in the summer, then back again in the fall. It’s the longest annual migration by a land animal in the Lower 48. The migration corridor includes critical stop-over habitats, where the ungulates “recharge” in quiet and nutritious habitats before continuing on across a patchwork of public and private lands. These stunning discoveries demonstrate an ancient lifeline that still exists today, not only for big game animals in western Wyoming, but for dozens of other species, as well. In turn, these species, and the habitats they depend on, are central to Wyoming’s outdoor heritage and our growing economy. Learn about wildlife migrations in Wyoming here. Data collected and analyzed by Wyoming biologists also demonstrate the fragile nature of this corridor system. Mule deer typically avoid human disturbance; too much human activity can cause the deer to rush through valuable stop-over areas, leaving them in poor condition for winter or the fawning season. Both scenarios threaten their survival. Interior Secretary Ryan Zinke issued a secretarial order to “enhance and improve the quality of big-game winter range and migration corridor habitat on Federal lands.” He deservedly earned accolades from a broad cross-section of western sportsmen and Wyomingites who asked for this protection. Yet the BLM, one of the agencies Secretary Zinke oversees, now appears intent on undermining the order by offering to sell oil and gas lease parcels in the Red Desert to Hoback corridor in September and December. This makes no sense. Western governors can influence the BLM when proposals to drill in critical wildlife habitat go too far or stray from Western values. That’s why we’re asking you to join us in giving Gov. Mead all the support he needs to stand up against this federal top-down action from the U.S. Department of Interior. 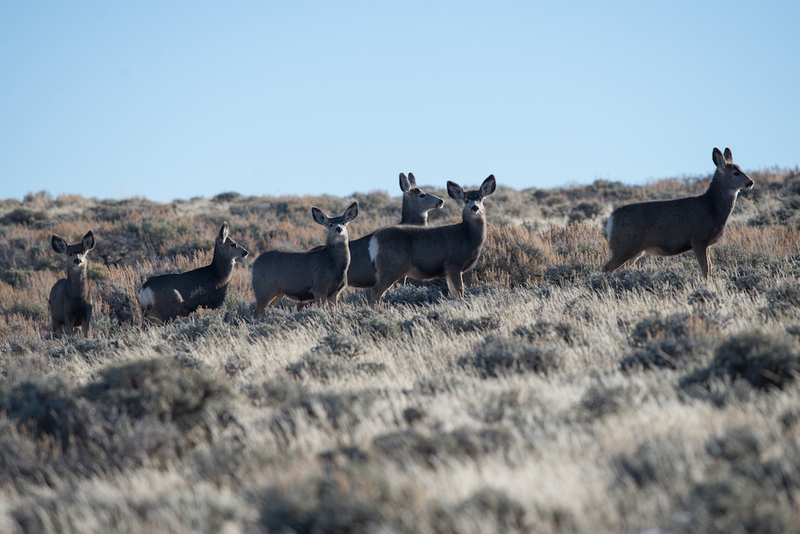 Protecting the Red Desert to Hoback mule deer migration corridor from leasing and subsequent development will not harm the oil and gas industry. Today this industry has 5,881 authorized permits to drill in Wyoming, and 9,000 pending applications for permits to drill here. The BLM is scheduled to greenlight more than 20,000 more wells throughout the state in the next 10 years. The few dozen federal oil and gas lease parcels scheduled for sale in the migration corridor are unnecessary to Wyoming’s robust oil and gas economy. If sold, the development of these parcels threaten to permanently sever this migration lifeline for wildlife — along with a massive sector of Wyoming’s hunting and outdoor recreation economy. Please contact Gov. Mead and let him know you appreciate his support for the world’s longest mule deer migration. Then ask him to oppose the BLM’s upcoming lease sales in the corridor.